This dish, robust in flavor, is incredibly easy to make and approximately one hour for prep time and cooking, which makes for a great meal for after school or after work. A quick method to roast tomatoes and add depth, crunch and flavor to any dish. 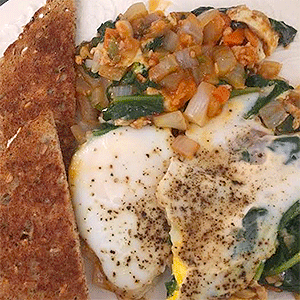 These are North African inspired poached eggs with spinach instead of the traditional tomato sauce. A great way to ingest your greens in the morning! 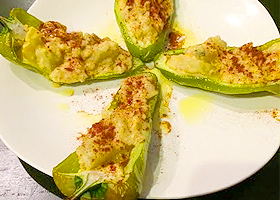 Delicious, simple, and a perfect crowd pleaser as a holiday appetizer or side. 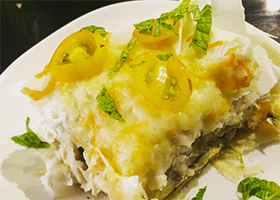 A yummy, easy to assemble phyllo dough pie will fill you up with less fat and sodium! 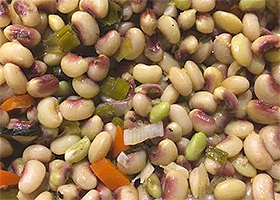 Move over black-eyed peas, a sweeter, pink-eyed pea is in season and ready to pop some flavor into your diet! 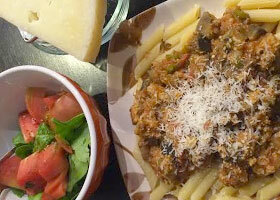 A great way to utilize ground turkey in a simple, wholesome meal. 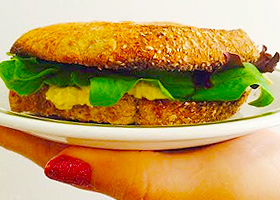 Tired of fake meat substitute for your vegetarian entreés? Are you that vegetarian that wishes for just once to share a holiday meal with family that did not involve a smattering of various veggie platters and tofurkey? Well here is the answer to your vegetarian conundrums for family get togethers over the holidays. Creamy- delicious, but less fat and cholestrol! Less cholestrol,less calories, and it tastes soooo good! Bring on autumn with this tasty meal. 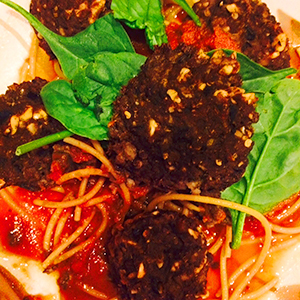 These meatballs have a meaty texture due to the eggplant. 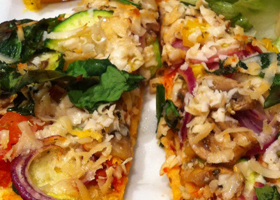 Take a break from gluten and try this yummy cauliflower pizza crust loaded with fresh veggies. 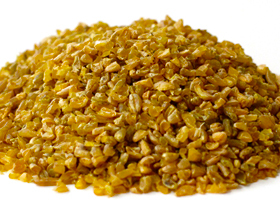 Considered a supergrain, freekeh has a smoky flavor that works well with simple proteins like beans and legumes. 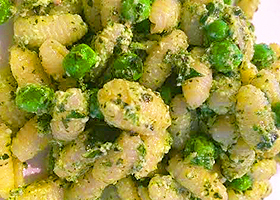 Try this recipe with your favorite lunch sandwich for more protein or alone as a herb salad you can eat leftovers of on the go. 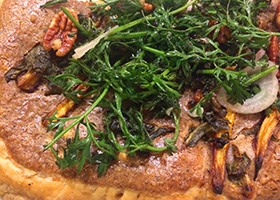 Wanna try a quiche that is full of Spring flavor but low in carbs and flourless? 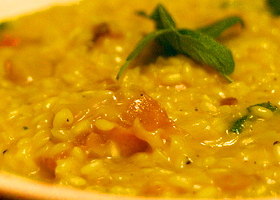 Try this mouth watering dish and enjoy the results. 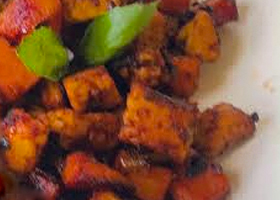 Looking for unique ways to serve up sweet potatoes? Well rev' up the blender or food processor and discover a meal so filling, so tasty, you will smack your lips after each spoonful. 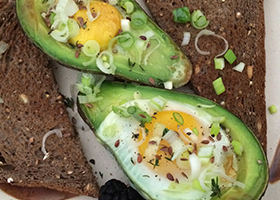 These toasts are great to eat with a big salad or a bowl of your favorite savory soup. Mix up the herbs and add diced cucumbers for an even more powerful punch of flavor. 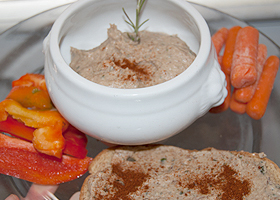 A great veggie twist on tuna salad served best with toasted multi-grain toast or on a bed of greens. 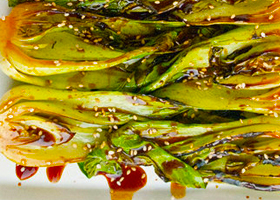 Bok choy is a wonderful cabbage-like-vegetable that is wonderful with seasonings. You can substitute bok choy with cabbage. 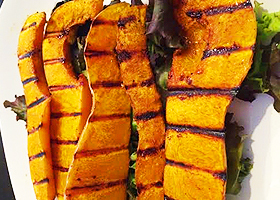 Delicata squash is light and filling when mixed with this crowd pleaser. 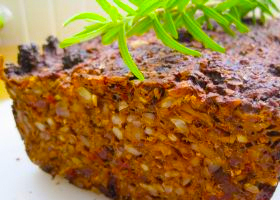 You can leave off the cheese if you wish to make this recipe vegan. This slaw is perfect by itself or as a side with chicken, beef, or pork. You can even use it as a dressing to make Banh mi Sandwiches. 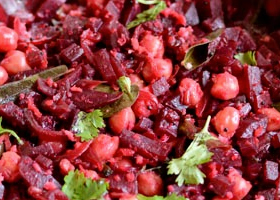 This holiday dish is perfect for vegetarians and a low-fat main dish to serve alongside your favorite holiday salads and veggies. 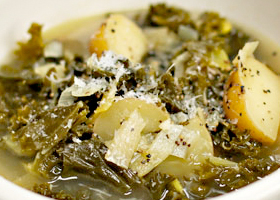 Ever wondered what to do with those turnip greens? 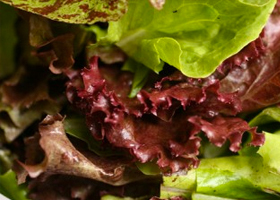 Try them in a tasty tart as lunch or dinner with a salad. 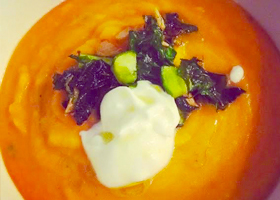 You can use butternut squash if pumpkin is not available. 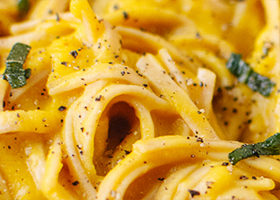 This light and low calorie cream sauce will rock your world. 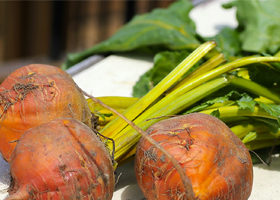 Add any other garden or fall veggies to the recipe to increase nutrition and flavor. Get a load of these veggies! 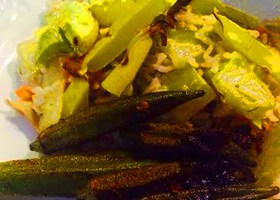 Berberé spiced okra is great grilled or lightly sauteed on the stove. Berberé spices are full of spicy flavor and low in sodium. Meatless, but wonderful to eat. Lunch or dinner is served in 15 minutes. Satisfying meatless burger charbroiled on a grill with mushrooms. 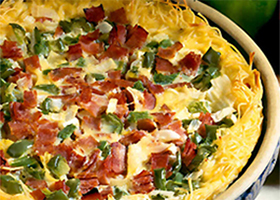 Get a boost of veggies with this wonderful egg-tastic meal that hits the spot for breakfast, brunch or dinner. 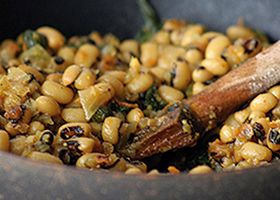 An excellent source of fiber, potassium, iron, and protein, black eye peas are great by themselves or mixed with other dishes. 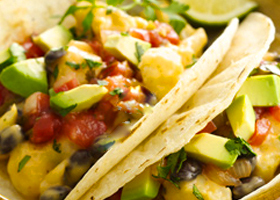 Veggie tacos are fun and easy to prep for a quick meal full of flavor and healthy good stuff! 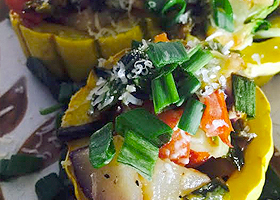 Having trouble making summer squash tasty for picky eaters? We have a solution, PESTO. 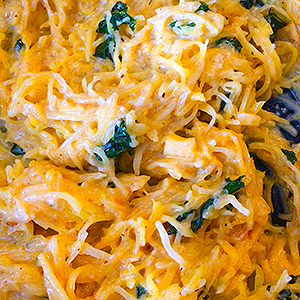 When squash is seasoned and prepared right (and healthy) even the pickiest of eaters will dig in. This recipe will consistently satisify you with only five ingredients. You can substitute tangerines with orange segments or clementines. 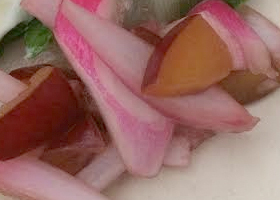 This salad is bright pink and full of colorful deliciousness. 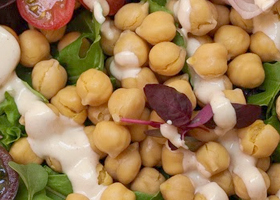 Chickpeas have absolutely no saturated fat and are high in fiber. 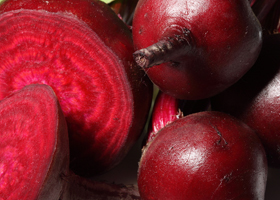 When you eat beets raw you are giving yourself a major boost in vitamin A and B as well as helping fight off heart disease. 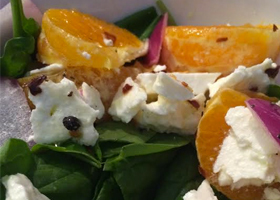 This salad is an easy citrusy meal served with a little goat cheese or mozzarella, it will make your mouth sing with flavor. Only 20 minutes to prepare and is great for a light lunch or fast dish to put together for a pitch-in dinner with friends and family. Okra can be the "slimiest" of veggies if prepared with too much moisture. Try roasting or grilling okra to enjoy it's full delicious flavor without the slimey experience. 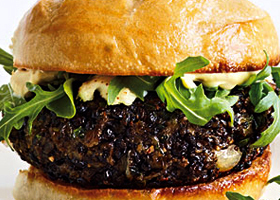 Red beans and rice are a local favorite, but have you tried making a red bean burger? 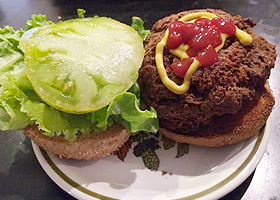 Full of iron, protein, and low in cholestrol and fat, these burgers are DY-NO-MITE with a slice of fresh green tomatoes, butter leaf lettuce, and a whole wheat bun. 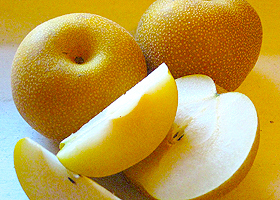 This green gourd, shaped like a pear and is often found in local grocery stores under the name chayote. In Louisiana, we know this tastey veggie by it's French-Creole name, mirliton. 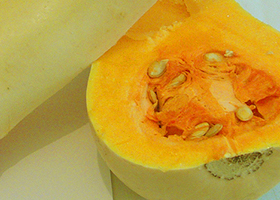 Cucuzza is a large zuchini-like squash. If you find it (and you won’t miss it) it stands two-three feet tall and tastes wonderful sauteed with the ingredients of this recipe. Be sure to play this ditty Louis Prima wrote about his cucuzza bella. 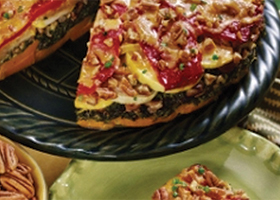 Rich and tangy this barbecue treat is great by itself or served with a salad, burger, or additional grilled veggies. Summer brings lots of fresh produce and garden tomatoes of several varieties. This gazpacho can be made from any tomato, but by choosing yellow you get more iron, pottasium, and zinc. 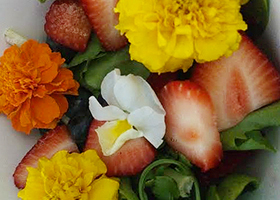 Take advantage of fresh berries and non-pesticide edible flowers. You can find edible flowrs in containers near the produce/herb section of your local grocery store. 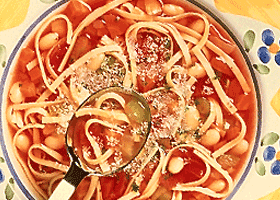 This cold summer soup is delicious with seafood and lighter sandwiches. Kept in an airtight container it will keep up to 5 days. 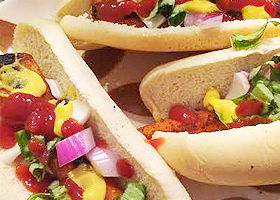 We've got the perfect solution for veggie lovers who want to enjoy a hot dog without soy or gluten: CARROT HOT DOGS. 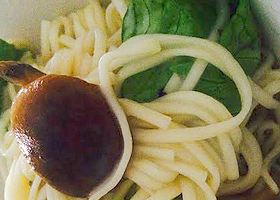 We TRIPLE dog dare you to use your imagination and add any other condiments or seasonings to spice up this recipe. This is a great dish for kids and a quick meal for anyone looking for homecooking just under 30 minutes. Local Creole tomatoes are available in the early summer months. 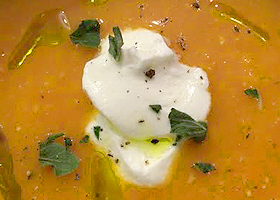 Take adantage of their crisp, wonderful fresh taste in this simple soup. 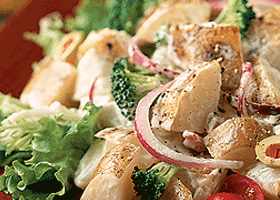 This salad is great by itself or with a lean protein of your choice (chicken breast, turkey, pork or tofu.) The nutritional info does not include lean protein. Enjoy! Creole tomato season gets started early in the summer and paired with pickled nectarine dressing and grilled artichokes, your tastebuds will thank you. 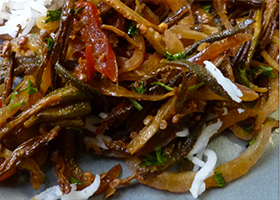 This vegetarian version of dirty rice is great with your favorite steamed veggies. 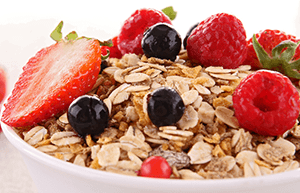 Light meals full of fresh ingredients are great for keeping cool in hot months but also help fill you up with valuable fiber and nutrients throughout the year. 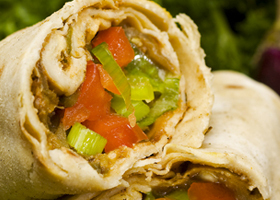 Try packing this easy and fast meal for lunch on the go and you will feel energized all afternoon. 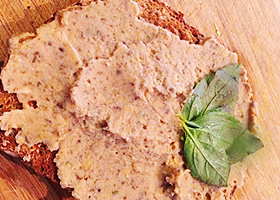 Cashew cheese is great for a non-dairy spread on nachos and only takes a little bit of planning to execute. 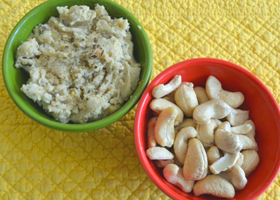 After you try this cashew puree you may never go back to yellow nacho cheese. This meatless veggie dish is great on French bread as a po boy or over rice. 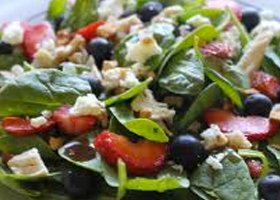 Summer is the right time to enjoy fresh fruit and savory greens together in a refreshing salad. 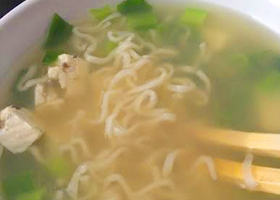 Fast, lower sodium version of ramen. Great for a quick one person lunch or dinner. 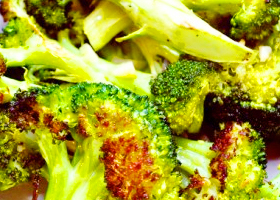 This roasted broccoli recipes works well for a side dish or with your favorite lean protein. 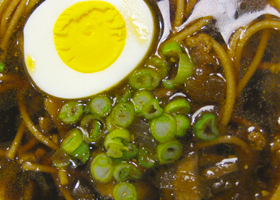 Here is a vegetarian friendly version of Yaka Mein. 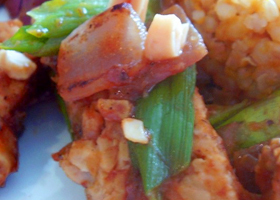 This dish is known for it’s wonderful blend of Southern and Chinese flavors. 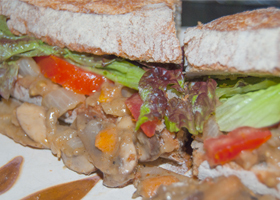 Try it without meat, or if you want to add a little protein try seitan, chunks of chicken, pork, or seafood. 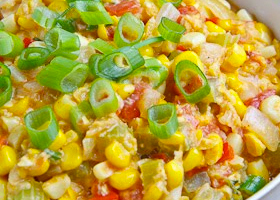 Maque Choux is a traditional Southern Louisiana creamy dish that works well with rice or by itself as a quick lunch or dinner. 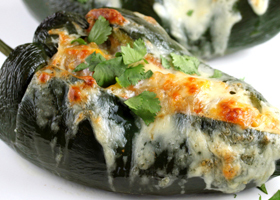 Easy clean up and this recipe can be prepared in the oven or on the grill. 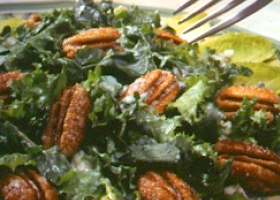 A vegetarian and non-dairy salad full of great taste. 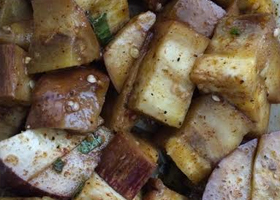 A veggie take on traditional ham hash with a traditional mixed salad and New Orleans dressing. 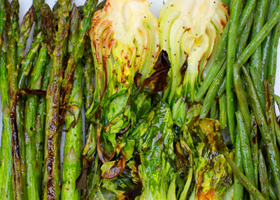 Welcome spring with lots of veggies! 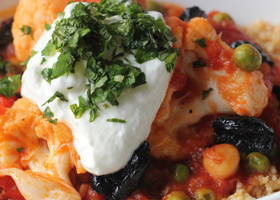 This is a great vegetarian take on a meatless version of chicken vindaloo. 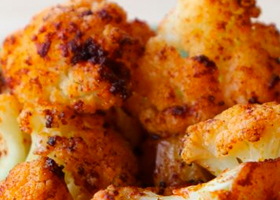 This also makes a great spicy side dish to accompany any lunch or dinner. This is a quick meatless meal with tofu. 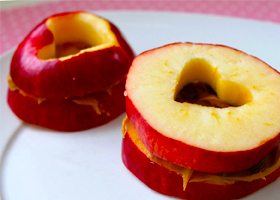 Makes a great sandwich filler in advance for a picnic or brown bagging it to the office. 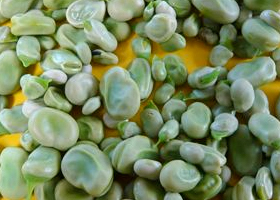 Fava beans, also known as broad beans make a quick vegetarian friendly dinner or a side dish. 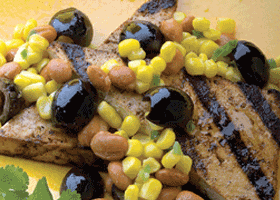 Moroccon spices bring a wonderful light spring flavor to your palette and your family table. 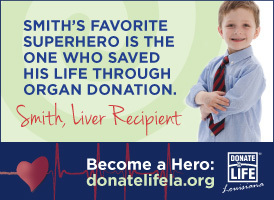 A Louisiana tradition that is served on Holy Thursday. 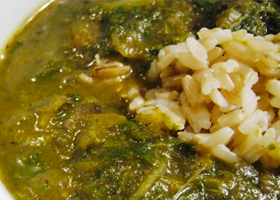 This is a vegetarian and gluten free version of this classic gumbo. Fennel is a light, sweet delicate bulb of a vegetable. It's great for potassium and fiber. 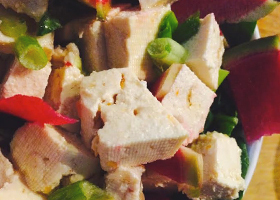 This is a great salad to add firm tofu to or fresh seafood such as shrimp or grilled tilapia. Recipe courtesy of EnLITEned Kosher Cooking. 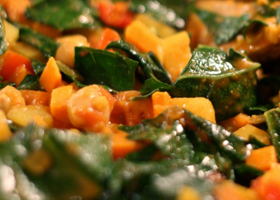 This vegetarian dish is a mix of Southern homecooking and Indian spices. A veggie friendly meal that is full of rich flavor and a wonderful main dish to serve with a pilaf, rice or steamed veggies. 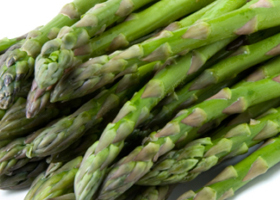 Spring is here, enjoy the fresh growing season Louisiana has to offer and fill up on local nutritious veggies. 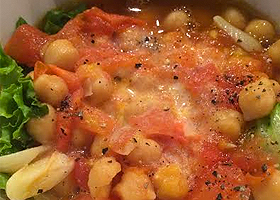 This dish is great with a warmed up piece of French bread or pita. 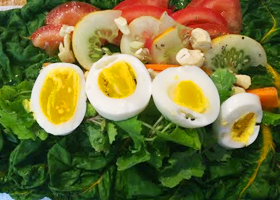 This is a fast and filling salad that is sure to help you get through the work day. 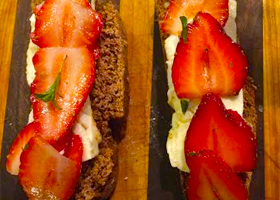 This recipe sounds fancy but is actually very simple to make. Louisiana peppers are a staple at any grocery market and home garden. 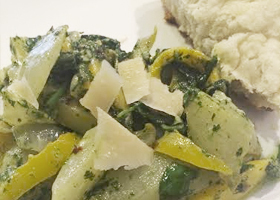 High in vitamin C and low in fat, recipes with peppers are great with a low calorie carb like rice, pasta or polenta. 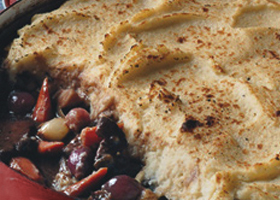 This dish stands alone with vegetables as a great filling dish. 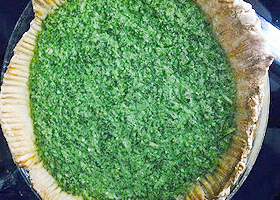 Make it for St. Patrick's Day or any meal you want to share with loved ones. Serve with your favorite salad. 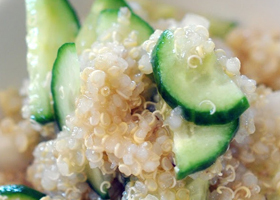 Light and full of protein, quinoa is great by itself or served with a lean protein (pork/chicken) or a side of fruit and steamed veggies. Recipe courtesy of Louisiana2step.com. 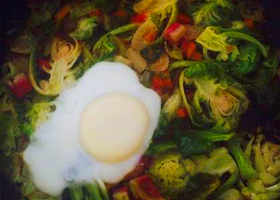 Celebrate St. Patrick's day with an Irish Colcannon soup. 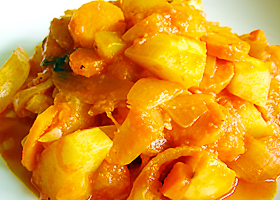 A wonderful vegetarian and light version of a potato stew. 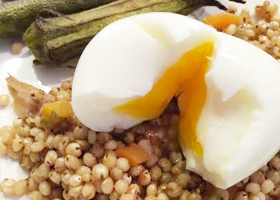 A heart healthy and easy way to enjoy eggs without frying or a messy clean up. 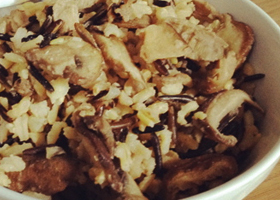 Marry the great taste of local Lousiana grapefruit with mushroom and rice. 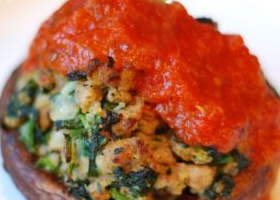 A loaded veggie recipe that is filling and easy to make. 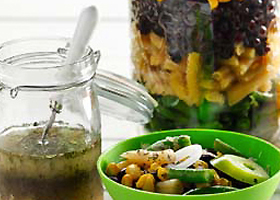 In a hurry to make a healthy lunch or need a quick flavorful dish to prepare for a get-together? 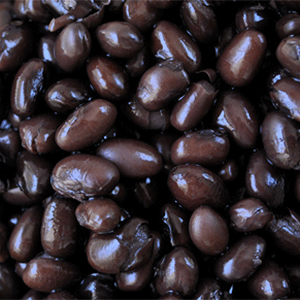 This bean salad will do the job. 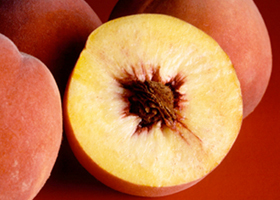 Recipe courtesy of CanolaInfo. 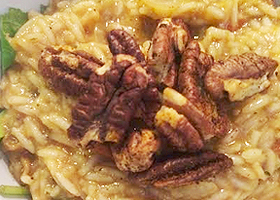 Louisiana knows how to make amazing pralines, but what if you could make a salad that is reminiscent of pralines and had less calories? 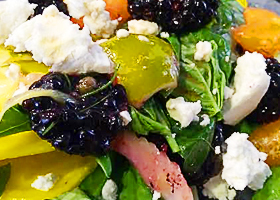 LiveWell has you covered with this sweet and savory salad. Courtesy of the Georgia Pecan Commission. 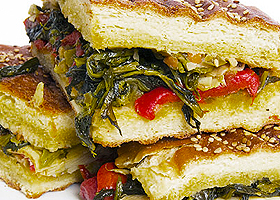 Socca or "Farinata" is a chickpea based flatbread. 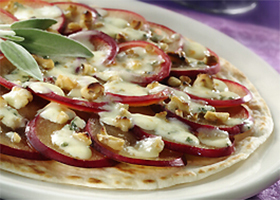 It's great for gluten-free pizza. 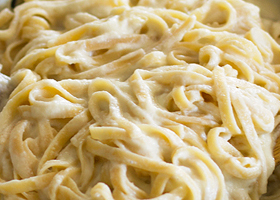 So creamy, so decadent and yet so delicious you won't miss the animal fat. 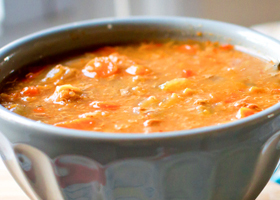 Protein rich quinoa can be a great heart healthy alternative to regular old meat stew. 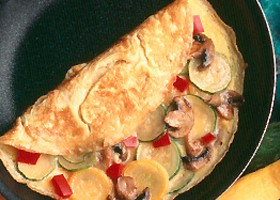 Breakfast, brunch, or dinner is the perfect time for a farm fresh market omelet. 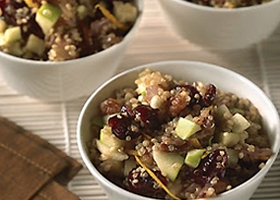 Quinoa has a nutty flavor but when combined with other savory herbs and seasonings is a delicious and filling. This recipe is also heart healthy. Recipes courtesy of "The Heart-Smart Diabetes Kitchen: Fresh, Fast Flavorful Recipes Made with Canola Oil" from the American Diabetes Association and CanolaInfo, copyright 2009. 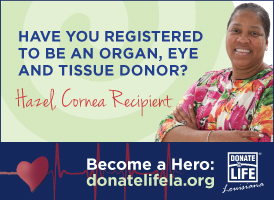 Photo by Taran [email protected] from "The Heart-Smart Diabetes Kitchen." 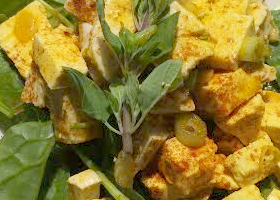 Delicious flavors in this recipe help spice up tofu. 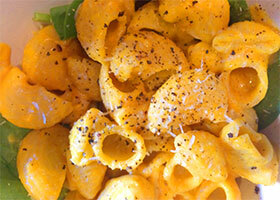 Recipe courtesy of National Pasta Association. 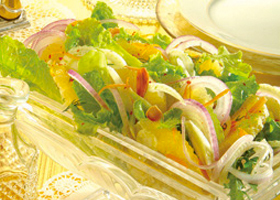 Vegetarian salad with filling potatoes and full of flavor. Recipe courtesy of Idaho Potato Commission. 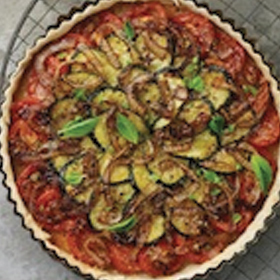 A hearty vegetable tart that makes a great lunch or dinner. 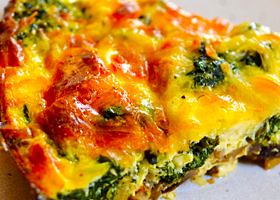 Perfect for breakfast or a lite meal anytime of the day. Recipe courtesy of The incredible edible egg™. 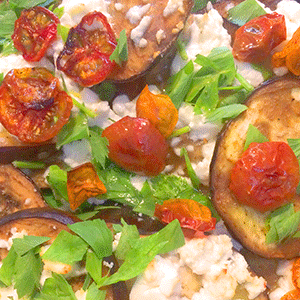 A quick and easy vegetarian dish to share with friends and family. Recipe courtesy of the All-Natural Diabetes Cookbook. 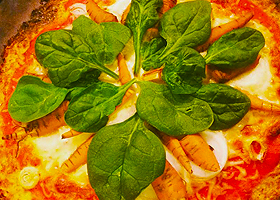 Quick and easy vegetarian pizza. Recipe courtesy of Wisconsin Milk Marketing Board.